Editor’s Note: Each month, Corrections.com will be providing articles that offer a deep look into gangs and the experts that study and battle them thanks to a group called Gangs Across America. GAA is an organization run by police, investigators and others who are focused on a national approach to gang prevention, interdiction, investigation and eradication. The articles on GAA’s site are written by a great variety of gang experts ranging from those working on the streets to those in correctional facilities. It is our hope that their insight will give readers the vital information they might need to understand and manage those gang members inside facilities. After being appointed as the first detective in charge of investigating crimes committed within the Bergen County (NJ) Correctional System, I realized the importance of the task at hand and how we had to prepare for the future threat of gangs. This new division was created as a way to alleviate the workload of the Bergen County Sheriff’s Department’s Detective Bureau and establish the first internal detective division for the correctional system. As Detective I attended a seminar hosted by the New York City Department of Corrections and the New York City Police Department entitled “Combating Gang Violence.” It became apparent to me that all the signs of gang activity were present inside the corrections facility of Bergen County. At that moment it clicked how naïve I was as a line officer not recognizing the danger signs that not only could jeopardize the safety of our personnel and inmates, but the security of the facility. In the following picture, crossing out a gang’s graffiti can lead to violence and jeopardize the safety of a correctional facility as well as the community outside the facility at large. My first mission was to sell to the administration on the reality that gang activity was occurring within the Bergen County Jail. Though difficult at first, the administration gradually became attentive and supportive of the important mission of identifying and combating gangs within the correctional facilities. The safety and security of each officer, the facility, and every inmate, depended upon it. Even fellow officers were skeptical, at first, but they quickly became empowered to help in the mission. With the difficult task of proactively targeting gangs and gathering as much information as possible, it wasn’t before long that I began to receive phone calls from local law enforcement agencies asking for my assistance in deciphering graffiti, providing informants, and assisting them with investigations related to gang violence, criminal activity, and safety in the school systems. This was the turning point for me. After all my years as a correction officer, I finally experienced a paradigm shift in the way that local law enforcement viewed the Department of Corrections and the value of a correction officer in criminal investigations. As my assistance became increasingly demanded in helping local law enforcement agencies, it became apparent that a gang intelligence unit needed to be developed and implemented within the Bergen County Jail. Once again I approached the administration regarding this issue that was apparently becoming a necessity. The Sheriff I was now dealing with, Sheriff Joel G. Trella, was a former “street cop” and subsequent Chief of Police in Bergen County. He understood the growing trend of gang activity occurring throughout the country and not only encouraged me, but allowed me to develop this division the way I deemed appropriate. With the direction and supervision of Sheriff Trella, and the assistance of fellow officers, the Bergen County Gang Intelligence Unit was created. This was a joint operation with the Bergen County Prosecutor’s Office. While investigating crimes occurring within the facility, gang-related or not, it became clear to me that the willingness of the inmates to share information, and the information they were providing, would also be beneficial to local police and federal enforcement agencies to assist in current criminal investigations and become the catalyst for new investigations. I was receiving information relating to gang activity, narcotics sales, burglary, homicide, and a host of other criminal activities. With information in hand, I was supplying leads regarding crimes to the appropriate law enforcement agencies. Based on the amount of information I was regularly supplying these agencies began to rely on me, more and more, for help in solving crimes. These agencies included the New York Police Department, the F.B.I., various Prosecutor’s offices, New Jersey State Police, and others. September 11 changed the way intelligence information is gathered forever. Those of us in corrections departments began to realize that gang mentality and terrorist mentality are really one in the same. Both, gangs and terrorists, are criminals who commit crimes for their own personal, ideological, and political gain. Their method for getting their message across is violence. Jails have become a breeding ground for groups such as Al-Qaeda and its affiliated terrorists. 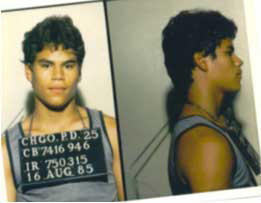 In fact, many gangs have Islamic radical connections that were cultivated in jails and prisons, such as the Black P Stone Nation, also known as El Rukns who was contracted by Muammar al-Gaddafi of Libya, and the Maniac Latin Disciple’s Jose Padilla (see Chicago Police booking photo below), who was recruited by Al Qaeda. As illustrated, we know that alliances between terrorists and street gangs have been a concern in law enforcement since the mid-1980s, but since 9/11 they have become a main focus of law enforcement. The new trend now involves detecting fundamental Islamic terrorists. Because terrorist cells are targeting street gang members to gain entry into the country via the Mexican and Canadian borders we in law enforcement must determine if a person gaining entry is connected in any way to a terrorist cell. We know that some terrorist cells will focus on members of the MS-13 (Mara Salvatrucha) as a way of infiltrating the country. With this need to add an emphasis on terrorists, I realized that I had to retrain myself on how to detect Islamic radicals within the prison system in order to train the front-line personnel. In order to educate myself I turned to Sgt. Lou Savelli who was the detective squad Commander for the Terrorism Interdiction Unit of the NYPD and whom I met at my initial seminar regarding gang activity in 1997 when he was the commanding officer of the NYPD gang unit. He advised me to participate in seminars being hosted regarding this new face of terrorism but to remain dedicated to street gangs and other criminals because there is definitely a connection. I knew I wanted to become involved in the fight against terrorists. It knew that it became the utmost importance that the line of questioning used by intake officers must be specific in trying to establish the regular inmate from an inmate with any gang and/or terrorist affiliations. I extensively trained our booking officers to detect these new changes from the typical street gang member’s symbolic use of clothing, tattoos and colors that would indicate their connection to any gang activity but added a line of questioning to uncover a terrorism connection. One of the most common techniques used by terrorists to gain entry into the U.S. is use of fraudulent documents. Some of the fraudulent documents used by the 9/11 hijackers were purchased out of Paterson, NJ, near my area of jurisdiction. It has been my experience that many law enforcement officers, including myself, had very little knowledge in detecting a fraudulent document. That is why training is so important. It is imperative that law enforcement officers are trained to identify these fraudulent documents as these are the first indication of possible terrorist ties and criminal activity. Another way terrorists identify themselves is through the use of signs and symbols. 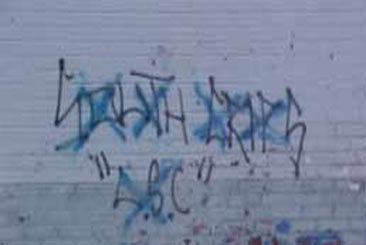 As many in law enforcement already know, gangs use graffiti as the so-called “newspapers of the street.” Graffiti is their way of communicating an alliance, a rising feud, etc., and acts to assist law enforcement in investigations. Terrorists also use their own signs and symbols to communicate with each other. It is imperative that law enforcement learn to decipher these signs, symbols, and codes if we are going to battle terrorism and to be aware of potential terrorist related graffiti and writings. The following picture was taken by Sgt Lou Savelli prior to the attacks of September 11th, 2001, in New York City. 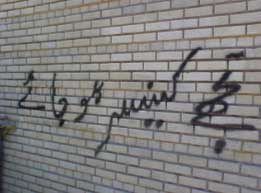 Roughly translated, it says, “…its time to cure the cancer!” You can only imagine that the Al Qaeda terrorist who wrote this graffiti was referring to America as Cancer. I feel obligated to stress the value that the Department of Corrections can provide to local law enforcement agencies in this fight against terrorism, street gangs, and all crimes committed for which there are few leads, however, it is imperative that other law enforcement entities and corrections departments realize the importance and the vast amount of valuable information that exists within correctional institutions. In fact, corrections officers may be the first law enforcement official that gang members or terrorists will approach with information. Law enforcement trainers must place a greater emphasis on training new officers to be alert and receptive to these inmates, as well as actively facilitating the elicitation of information. The old stereotypes of criminal and cop must be put aside. We are living in a new world where attention must be paid at all times. Most importantly, attention must be paid to these incarcerated individuals if we are to make any strides in the war against crime and terror. This story was previously published on Gangs Across America website.